Forget Building Our Own Tea Party. The Left Can Win So Much More. This post originally appeared at In These Times. On Feb. 19, 2009, just 30 days after President Obama was sworn in, Rick Santelli’s rant on the floor of the Chicago Mercantile Exchange launched the tea party. The conservative establishment worked together with the grass roots to fan the flames of opposition. The resulting tidal wave swept Republicans to power at the national and state level in 2010 — and set the stage for Trump’s victory in 2016. This isn’t just about electoral politics, it’s about shifting political and economic power across the board. Since at least 2012, I’ve worked in and with organizations that saw the tea party as a model for the left. While we abhorred their politics, we admired their tactics and coveted their success. The tea party pioneered a strategy that enabled grass-roots activists and candidates to work inside and outside of the Republican Party to advance a “principled” conservative agenda. And they won — big time. In the wake of Trump’s election, we’re seeing a tsunami of progressive activism. The confrontations with lawmakers around the country during the February congressional recess were nearly mirror images of the town halls the tea party crashed as Congress first debated Obamacare. Unsurprisingly, commentators and pundits have quickly drawn parallels between what happened in 2009 and what’s happening today. But the commentators are wrong — and if the left continues to take the tea party as our model, we might lose out on our biggest opportunity to make large-scale progressive political change in decades. As Trump and the Republicans have begun — rather clumsily — to manipulate the levers of the federal government, we are under attack from all sides. Republicans have moved with breathtaking speed to roll back progress on immigration and civil rights, on health care and the environment and on regulating Wall Street and the corporate elite. More frightening still, we have seen the Trump administration begin toying with authoritarian tactics and threatening to undo the post-World War II global order. Practically overnight, it feels like everything has changed. We have seen the Trump administration begin toying with authoritarian tactics and threatening to undo the post-World War II global order. Given this onslaught, it’s easy to forget that roughly 3 in 4 Americans didn’t vote for Donald Trump in November. If our electoral system wasn’t rigged against democracy, Trump wouldn’t even be president. But now that he’s assumed office, Trump is the least popular president in modern American history. So while Trump and the Republicans control the federal government, we must remind ourselves that the vast majority of the American people are on our side. In fact, that is the real story of the last six weeks. While the media has been glued to Trump’s every tweet, millions of Americans have taken to the streets to protest his agenda. More than 3.7 million people — one out of every 100 Americans — flooded into the streets to participate in the Women’s March. Within 48 hours of Trump’s initial Muslim ban, thousands gathered at airports around the country demanding that immigrants and refugees be released from detainment. During the February recess, People’s Action, MoveOn and the Working Families Party organized more than 600 town hall events. While it’s difficult to predict how long this level of activity can be sustained, we have already seen resistance to the new administration that is unprecedented in recent history. This is precisely where comparisons to the tea party start to break down. According to commentators and many in the media, what we’re seeing now is merely history repeating itself. Republicans have control of the federal government, just as Democrats did in 2009, and now it’s liberals and the left in the streets instead of old white people dressed in colonial garb. But the tea party only ever represented a tiny faction of Americans. We, on the other hand, are the clear majority. Political scientists Theda Skocpal and Vanessa Williamson estimate in their book The Tea Party and the Remaking of Republican Conservatism that at its height only about 200,000 Americans were active in the tea party at the local level. It’s too early to say exactly how many Americans are engaged in the current protest movement, but already there are signs that we’re organizing at a scale that dwarfs the tea party. For example, the tea party first debuted on the national stage when they held roughly 750 Tax Day events around the country. But only 250,000 Americans attended those events. 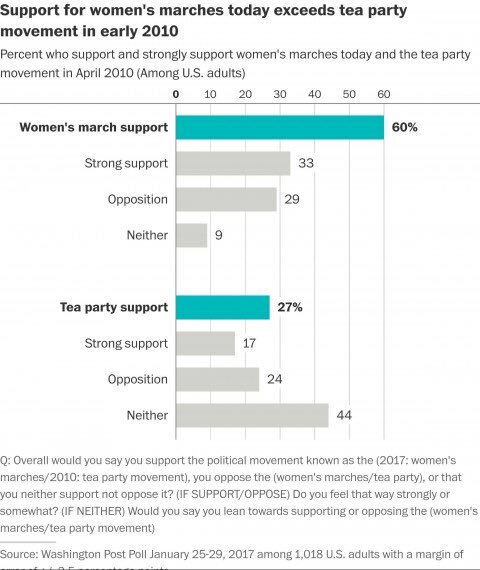 In other words, the tea party’s Tax Day protests were 15 times smaller than the Women’s March. Of course, participation at a single event does not necessarily foretell prolonged participation in a social movement. But the fact that a small group of former Hill staffers and progressive organizers could help launch more than 4,500 local groups in less than four weeks suggests a massive groundswell of people interested in sustained political participation. The scale of active engagement is mirrored by public support. Polling conducted by The Washington Post in April 2010 found that roughly 27 percent of Americans supported the tea party. By contrast, a full 60 percent supported the Women’s March. At the policy level, the difference is even starker. When the tea party held their Tax Day protests, polling showed that 65 percent of Americans actually backed Obama’s overall economic plans and 62 percent approved of how he was handling taxes. Their colorful protests may have generated a media frenzy, but the policies they were intended to bolster did not have popular support. Those who have participated in recent marches, rallies and actions are protesting a wide array of Republican policies. But if we take just two core policies pushed by Trump and the GOP, we can see that the resistance to those policies — and support for progressive alternatives — is broad. If we take just two core policies pushed by Trump and the GOP, we can see that the resistance to those policies — and support for progressive alternatives — is broad. Last week, Republicans introduced their bill to repeal and replace Obamacare, despite the fact that the law is supported by a majority of Americans. The Republican repeal bill also proposes deep cuts to Medicaid, something that has historically been opposed by 84 percent of Americans. And there’s evidence to suggest that public support for a Medicare-for-all system is even greater than support for Obamacare. Tax cuts for corporations and the wealthy are also a centerpiece of the Republican agenda. Yet, a series of post-election polls compiled by Americans for Tax Fairness show that Americans oppose cutting taxes for big corporations and the rich by roughly a 2-to-1 margin. Gallup polls consistently show that similar margins believe corporations and the wealthy already pay too little in taxes. Despite widespread support on issues like health care and taxation, the anti-Trump resistance is clearly an ideologically heterogeneous bunch, encompassing leftists, centrist Democrats, independents and perhaps even some moderate Republicans. That means our task is to organize. Republicans have used voter suppression, redistricting and other undemocratic aspects of government — such as the Electoral College and the Senate — to take power, despite the fact that many of their policies are extremely unpopular with large segments of the public. They have also used the media, think tanks and the academy to manufacture public consent to policies that hurt many of the same people who support them. Our goal must be to bring together different constituencies within the resistance movement, those motivated by diverse struggles, to support a bold platform for social change that will make life better for the working class as a whole. The tea party was a minority faction within the Republican Party funded by the wealthy elite. Our aim shouldn’t be the creation of a faction within the Democratic Party. It should be to forge a new American majority. Neoliberalism has been in crisis for at least a decade, and the crisis of legitimacy that elites — including politicians from both parties — face today is far more acute than it was in 2009. As a result, both parties face deep internal rifts. We should not simply aim to pull the Democratic Party to the left. We should work to redraw the lines of the entire political map so that we find ourselves at the center. We should not simply aim to pull the Democratic Party to the left. We should work to redraw the lines of the entire political map so that we find ourselves at the center. This doesn’t mean abandoning our principled politics or the hardscrabble tactics pioneered by the tea party. We can and should mount primary challenges to corporate Democrats and collaborators, including members of the current Democratic leadership. Efforts like WeWillReplaceYou.org, a new Political Action Committee created by #AllofUs, are an important addition to work that has been done by groups like People’s Action and the Working Families Party. Nevertheless, all of these efforts should be seen as tactics inside of a broader strategy to redraw the political map. The aim should be threefold. First, we should aim to take over the Democratic Party wholesale and make it into a vehicle for the working class. In addition to electing real progressives to office, this means building a greatly expanded coalition of active voters and a genuinely progressive policy platform. Second, we should exploit Trump’s incompetence and the factions within the Republican Party to decimate it for decades to come. Where possible and without compromising progressive principles, we should aim to peel off sections of the Republican coalition to join our side. Finally, we should work for structural reforms that make both the party structure and the electoral system itself more democratic. That means everything from giving working people real decision-making power over the direction of the Democratic Party to making it more feasible for third parties to run and win governing power to rewriting the rules to eliminate the Electoral College and other undemocratic elements of our political system. This isn’t just about electoral politics, it’s about shifting political and economic power across the board. While the tea party propelled electoral victories, it did not generate sustained and politically independent social movements. Since the tea party was funded by the wealthy elite, it didn’t put significant pressure on Wall Street and the ruling class, despite being fueled in part by anti-Wall Street sentiment. While Trump and the Republicans control the White House, Congress and 25 state governments, our goal can’t just be to reclaim those seats and offices. Even in places around the globe where Left-leaning political parties have won significant governing power, such as Podemos in Spain and Syriza in Greece, they have been largely unable to achieve their desired reforms in part because of the vast economic power that weighs against them. We shouldn’t lose sight of the fact that politicians face structural limits on their power. Even progressive governments need outside help. We must build social movements strong enough to win governing power and challenge the dominance of capital, markets and the corporate elite. Together, we can forge a new American majority. It may become possible to achieve progressive change far greater than we would ever have imagined just a few years ago. But doing so will require those of us on the Left to stop confining ourselves to the margins so that we can redefine the center. Jacob Swenson-Lengyel is an organizer and writer who lives in Chicago. He completed an A.M. in philosophy at the University of Chicago before becoming involved in political work full-time. Read more of his writing at https://jacobswenson.me or follow him on Twitter: @_JacobSL.